In our continuing effort to support our clients, MGD+A is excited to announce our schedule of Transformational Strategies Institutes. The transformation of higher education is evolving more rapidly with each annual cycle. While dealing with the annual litany of challenges, remember that a longer more permanent transformation is underway. The paradigm shift to the learning age is powered by a global digital learning ecosystem requiring unprecedented focus on academic and enrollment strategy. The planning horizon is characterized by increased demands for accountability, increased competition, significant learner and institutional economic challenges, and significant differences of opinion on how the future should be approached. Our Institute series recognizes the need for unprecedented collaboration between academic and enrollment domains guided by new visionary strategic plans that forge a cohesive approach to a future full of uncertainty. We continually develop resources to help the journey into the future. Strategy is at the center of our Institute curricula. Our approach is one that seeks to optimize the unique advantages and assets each and every college and university possesses. Our strategy tool box provides the necessary means and methods to design, develop, and implement effective transformational change. Our curriculum-centered framework rests upon sound learner-centered principles and practices. MGD+A began offering Institutes covering Transformational Strategies in 1998, shortly after publishing Transforming Higher Education. Our institutes can be delivered as professional development or strategic initiatives events at an institution. Enrollment is limited to 40 participants in each Claremont event. Accommodations for all events are at the DoubleTree by Hilton Hotel Claremont, 555 W. Foothill Blvd. Claremont (Los Angeles Area), California 91711. Each Institute begins Monday or Wednesday afternoon permitting weekend air travel helping to keep air travel costs contained. Los Angeles is served by five airports (LAX, SNA, BUR, ONT, LGB ). The Claremont location is central to Los Angeles area sites and attractions. Registration can be completed online and participants can either be invoiced in advance or register by credit card. The Academic SEM Curriculum Development & Revitalization Workshop recognizes that enrollment performance and the quality of the curriculum can both be significantly enhanced when curriculum is prepared, aligned, reengineered, or tweaked with enrollment markets in mind. The workshop articulates methods to recalibrate fundamental curriculum design and content to better align with the enrollment marketplace. The workshop is designed to help academics and enrollment managers to better position curriculum and programs of study in the complex global learning marketplace and improving enrollment performance. The design of the Institute for Academic Strategies for Revitalizing Schools and Programs provides a strong foundation for academic leaders, deans, department chairs and faculty entrepreneurs preparing to optimize the quality and enrollment potential of their programs of study. 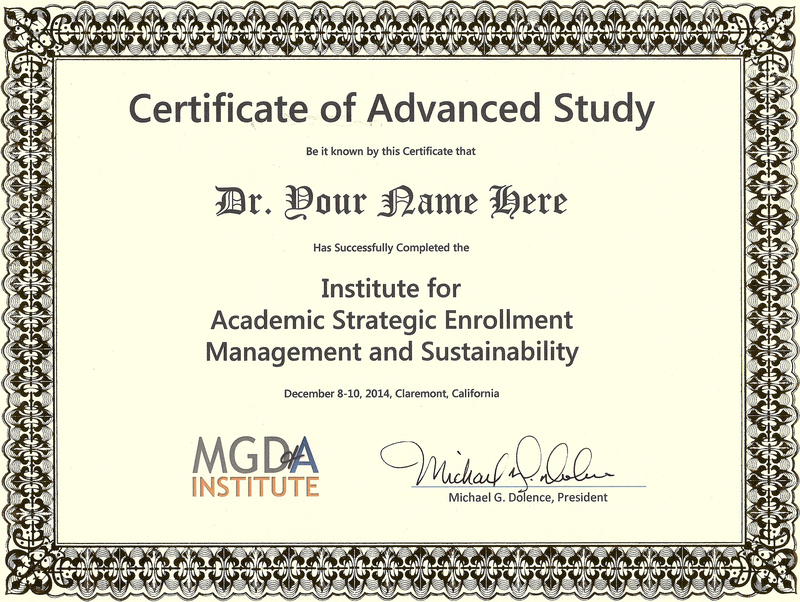 The design of the Institute for Academic Strategic Enrollment Management and Sustainability recognizes that academic leadership and enrollment management professionals must join forces in order to meet the challenges and opportunities of higher education as it is carried into the future by the paradigm shift to a global digital learning ecosystem. Once joined, they form a resilient and effective Academic SEM community of practice capable of forging near, mid, and long term strategies for enrollment and fiscal health. The design of the Institute for Academic Strategic Enrollment Management and Sustainability recognizes that academic leadership and enrollment management professionals must join forces in order to meet the challenges and opportunities of higher education as it is carried into the future by the paradigm shift to a global digital learning ecosystem. Once joined they form a resilient and effective Academic SEM community of practice capable of forging near, mid, and long term strategies for enrollment and fiscal health. The design of the Institute for Academic Strategies and Master Academic Planning recognizes that academic leaders must plan to meet the challenges and opportunities of higher education as it is carried into the future by the paradigm shift to a global digital learning ecosystem. Without a Master Academic Plan, an Institutional Strategic Plan is powerless at forging near, mid, and long term strategies for enrollment and fiscal health. The design of the Institute for Curriculum-Centered Strategic Planning & Learner-Centered Curriculum recognizes the centrality of the learner to the curriculum and the primacy of the curriculum to the institutional strategic plan. It also recognizes that planning for education in the learning age is supported by a global digital learning ecosystem. The planning horizon is characterized by increased demands for accountability, increased competition, significant learner and institutional economic challenges, and significant differences of opinion on how the future should be approached. The Academic SEM Campaign Planning Workshop acknowledges that the nature, scope, and methods of recruiting have changed dramatically over the past few years. The workshop recalibrates the fundamental components, restructures an alignment around five integrated workflows, the intent of which, is to develop a strong competitive position in the enrollment marketplace. A well constructed campaign once developed and launched is capable of sustaining near, mid, and long term strategies for enrollment performance and fiscal health.